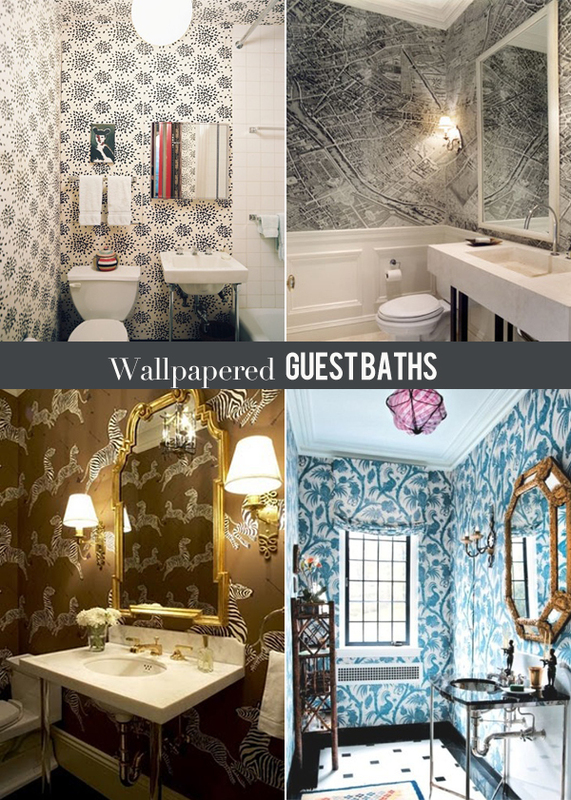 Wallpaper || What is your powder bath personality? The powder bathroom to me is one of the most important rooms in a home. 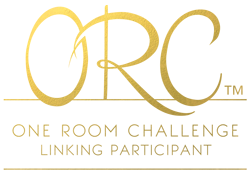 It is the room where you can let lose and add adventurous and unexpected elements. The powder bath is where I always like to have an element of surprise. My previous powder bathroom had red/deep pink high-gloss walls and ceiling. Friends were quite shocked when they opened the door from the unassuming hallway to this little gem of a room. Now, I have high-gloss turquoise....also fun but not as dramatic. My next powder bath will be showing off its personality through its wallpaper for sure. 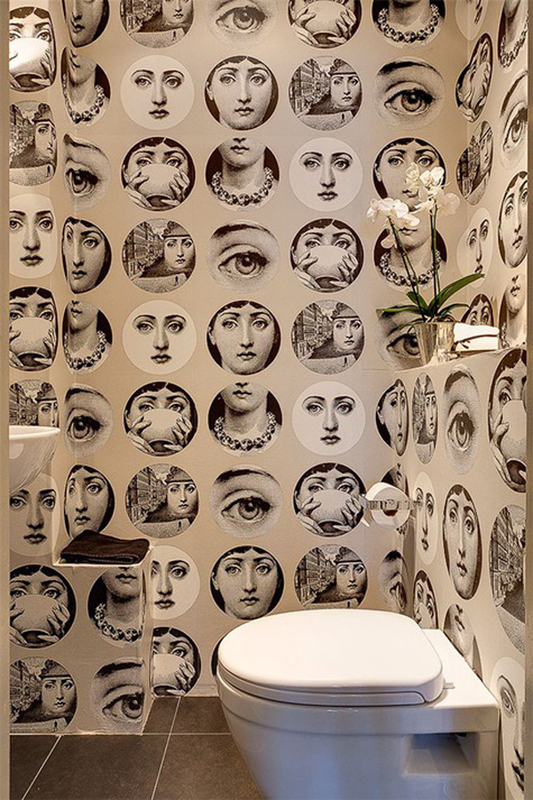 There are so many beautiful wallpaper options out there waiting to be used in creative ways.....I'm wondering what kind of a powder room personality would you have? Wallpaper is fun, adds drama, and can definitely make a statement. The above powder is to die for no? I would call this 'Chinoiserie chic glam'. And this one below? Toned-down neutrals with a splash of industrial? This one is a playful powder for sure. Here are few more fun ones. So would you go bold in the powder? or do you prefer to keep it in line with the rest of your home? Bold in the powder room is a must! Why not have a little fun in such a tiny little space. Love this post. Couldn't agree more...the powder room is the perfect place to add a punch! I've been wanting the doggy wallpaper for sometime now :) as a side note I was reading an online discussion where people said there is never a reason to use high gloss or lacquer in your home! Pure craziness! 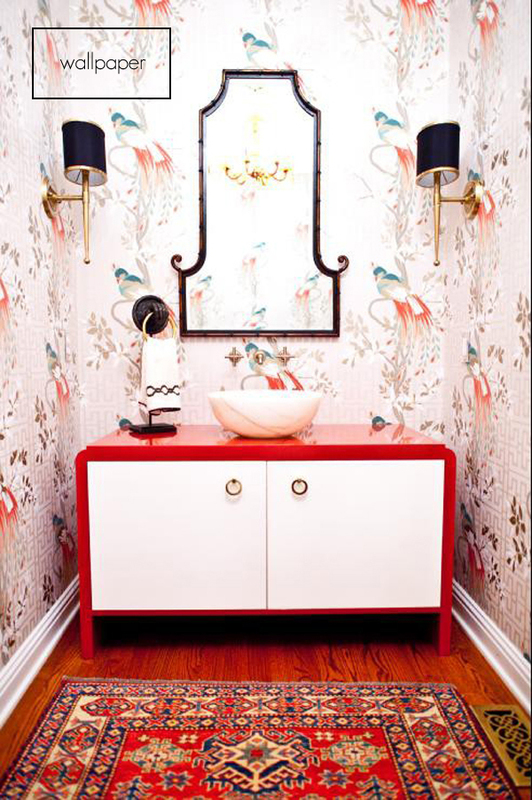 Bold and fun in the powder room, definitely! Gold and blue stripes in my dream powder room! I love this look and definitely think the hardest part is choosing which one! Love the zebras, dogs, and birds the best. Oh gurl, you know I loves me a snazzy powder room! Would design em all day long if I could. I think the room with the all the faces would freak me out a bit. The second is my fave and that red/white vanity in the first is to die for. 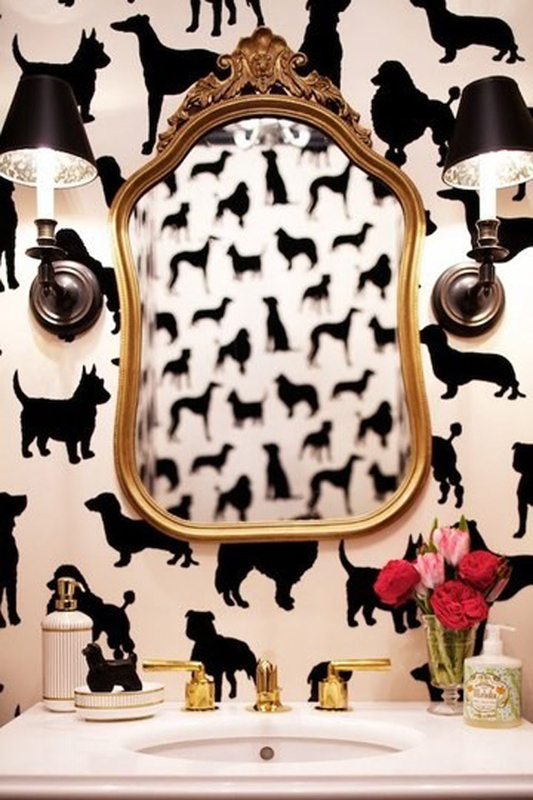 I am so obsessed with that dog wallpaper! I don't know how many times I've posted/pinned/tumbled that image :) One of my favorites! Bold in the powder room! I have such a vivid memory of walking into a newly married friend's first home and seeing their powder bath papered wall to ceiling with the darkest, glossiest blue moulding. I was so young then and I had not ever seen anybody go crazy with decor like that in any part of their house. It made such a big impression on me. I made quite a few trips to that little bathroom during our visit. I totally agree...bold powder rooms are the best! We had a bright red one too in our previous house, but I'm loving the wallpaper idea! All the different patterns and prints are just so pretty! IT is a room I feel I can experiment with more than the others, for sure. I am loving wallpaper lately, and it took me years to come back around after peeling every shred of it off my walls and going paperless for the last 10 years. Fun post! Have a great day. 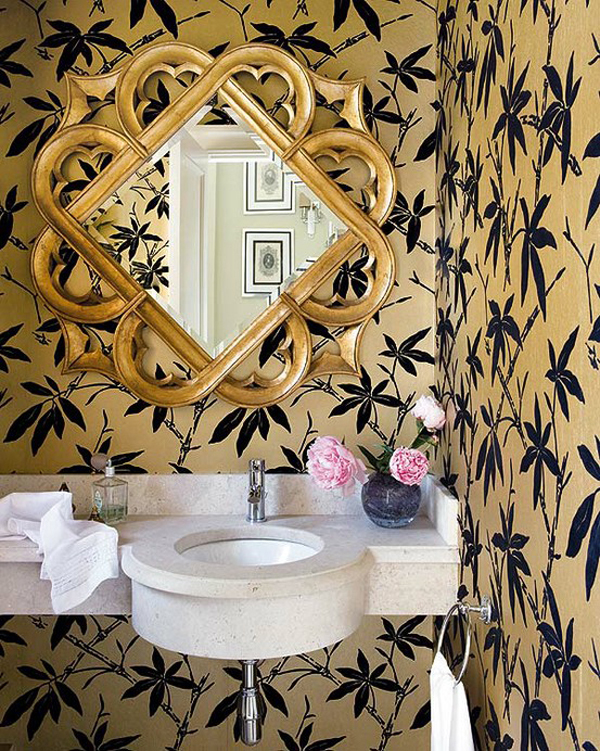 i would DEF gold BOLD in a powder room - why not! oh thanks for pointing that out! I appreciate it! Marya's right it's tile...love all the other papers though! i love using wall paper... its such a fun way to brighten up your space! I think it's the perfect opportunity to take a risk and do something a little unexpected. You're there for such a short period of time and you can close the door to the rest of the house! Perfect timing! I'm actually painting my powder today. I was soooo torn! I found the wallpaper I wanted and it's $198/roll. Then installation. Then I realized paint would be about $50. You seriously have me regretting my choice! I still may add a wallpaper accent wall down the line. I always loved the wallpaper in the powder room!!! 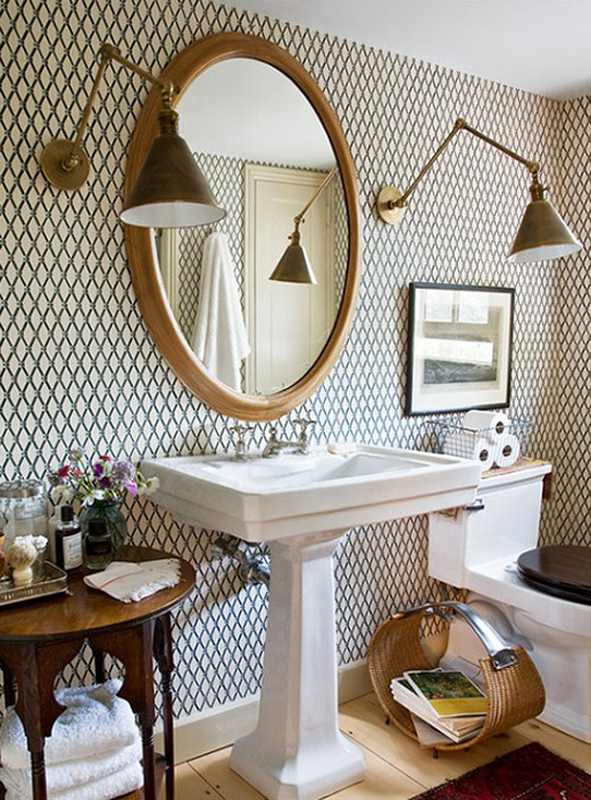 LOVE a wallpapered powder room! Can't wait to have one of my own! Thinking I must do something along the lines of de Gournay's monkey wallpaper in mine! I love wallpaper in powder rooms! I just need the perfect bathroom to put it in!